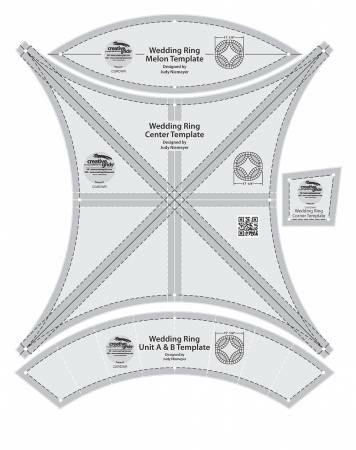 Templates designed by Judy Niemeyer, work with her doublewedding ring patterns: JNQ74P; JNQ85P;JNQ95P; JNQ96PJNQ110P; JNQ113P; JNQ120P; JNQ127P. Use these 17-1/4intemplates to cut the segments needed to create other doublewedding ring quilts. Cut curves with a 45mm or 60mm cutter.